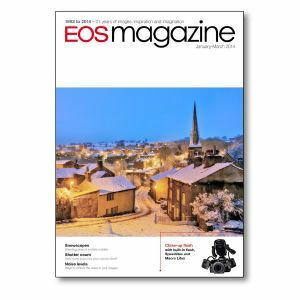 Add this issue to your photographic library for information on EF-S lenses, close-up flash, shutter counts, DPP extras, where to check to see if there is an update for your camera or software, plus much more. Canon winter cashback - Receive money back when you buy cameras, lenses or Speedlites in Canon's latest promotion. Travel Photographer of the Year - EOS photographers win both the main award and Young Travel Photographer of the year. Wildlife Photographer of the Year - Winning entries from the world's most respected wildlife photo competition. Firmware and software updates - Check to see if there is an update for your camera or software, and the benefits and fixes offered. Getting closer - See what a few close-up accessories can do for your photography. Photoworkshops - Our expanding programme of events at our training facility at Tackley, Oxfordshire. EF-S lenses - We clear up confusion about the lens mount introduced ten years ago. Close-up flash - Flash equipment and illumination techniques for close-up photography. Shutter count - Are you curious to find out how many times your camera's shutter has fired? We show you how. Centre point - Shooting with a wide aperture is an effective creative technique, but it requires practise. DPOF explained - Digital Print Order Format is a feature of most EOS cameras. We explain what it is and how to use it. Snowscapes - Striking images of wintry scenes require perseverance and precise exposure. Noise levels - We answer your questions about camera noise and how best to keep it to a minimum. How was it shot? - Peter Saint Martin combines light painting techniques with theatrical production. DPP extras - We look further into Canon's Digital Photo Professional software and what it can do. Don't panic! - What to do if your camera flashes up an error code warning. Freelance diary - Miles Willis captures the customs and colours at his first Sikh wedding.